boat shopping | Are We There Yet? Russ and I took the girls on a drive yesterday. We drove down to Lake Champlain, taking the back roads, dirt roads we’d not taken before, just to make it more interesting. We were headed to a marina. 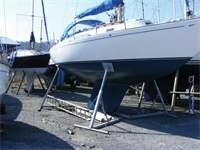 To look at sailboats for sale.